This one is from October of 2011. It was a nice fall day with a temp in the low 60’s. Some showers had just passed and a mix of good clouds and sun prevailed. This type of light and sky is one of may favorite conditions for landscape photography. If it was a bit later in the day the light would have been even better, but you have to take advantage of what you get. I shot several nice photos that day in the St. James and Butterfield areas of MN. 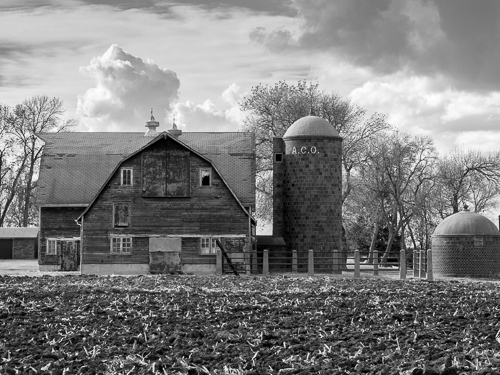 This entry was posted in Uncategorized and tagged ACO Silo, Adolph Casimir Ochs, afternoon sun, agriculture, barn, brick silo, copyright ryan ware, family farm, farm, farm site, field, silo, wood barn. Bookmark the permalink. You’re right. Light can make a huge difference in an image. This one is stunning. I once lived and worked in St. James so know that prairie area.